The concurrent resolution from the Delaware Senate and Delaware House of Representatives passed on March 23rd, 2017 and will be signed by the Governor. The resolution declares Homelessness Awareness Week as March 27th to April 3rd, 2017 and we would like to bring awareness to our homeless population and need your help! Please help us gather supplies. We are collecting back-packs, duffel bags, sleeping bags, tents, sternos (heat source), bottled water, bottled sports drinks, socks, foot powder, baby wipes, mini lint rollers (helps remove ticks off clothing), bug spray, and sunscreen. Please drop off to our partner locations: Home Team Realty: 959 Norman Eskridge Hwy, Seaford, DE (M-F 9am-5pm and Sat 9am-12pm) Blades Town Hall: 20 W Fourth Street, Blades, DE (M-F 9am-4pm), Avenue United Methodist Church: 20 N Church Street, Milford, DE (M-F 9:30am-3pm), DryZone: 16507 Beach Highway, Ellendale, DE 19941 (M-F 9am – 5pm), Schanne Insurance State Farm: 915 S. DuPont Hwy. Milford, DE (M-F 9am – 5pm). Any questions please email us at sussexcountycodepurple@gmail.com. Code Purple Sussex County is in effect for Wednesday, March 22nd and Thursday, March 23rd, 2017 with the overnight lows being in the 20’s. We need volunteers to sign up for intake, dinner, and overnights. Please call Tammi at 302-242-8076 about volunteering or Vikki at 302-853-0997 for dinner. Use our calendar at Volunteer Calendar! 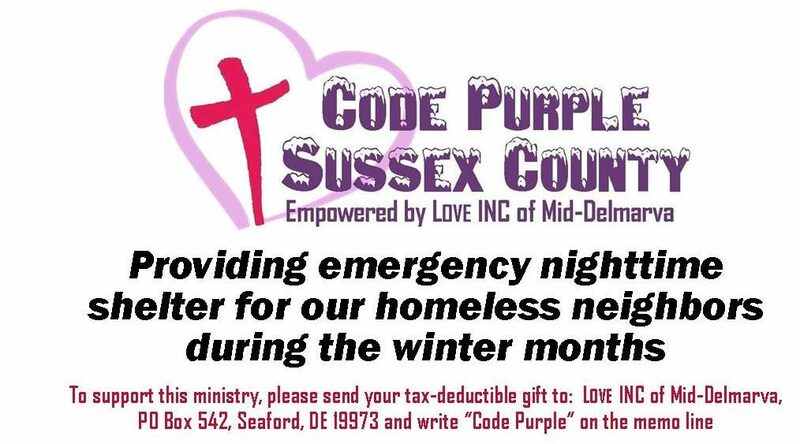 See shelter listing below for Code Purple Sussex County below and additional shelters around the county. Please note St. Luke’s Parish House will not be open this week. Gateway Fellowship will be open for men, women, and children. Gateway Fellowship: 8110 Cannon Road, Bridgeville, DE. Call Nikki Gonzalez at 302-519-0024. In-take 7pm to 9pm. Men, women, and children. Dinner served at 7pm.